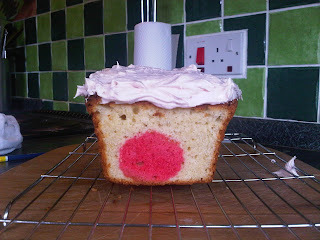 I came across this idea on Bake it in a Cake and was immediately desperate to give it a go. Unfortunately, the website was undergoing construction and there were no recipes regarding how to make this cake. Alongside this, they had made cupcake versions and I wanted to make a full cake. I googled the idea and came across a version on Butter Hearts Sugar. 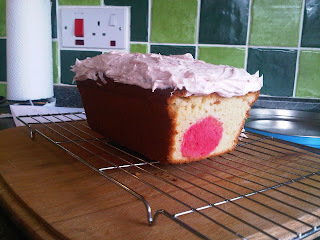 This recipe was for a loaf cake which was what I was looking for but it used heart shaped cutters that I didn't have. This was the only website which clearly explained the steps in making such a creation, go have a look! 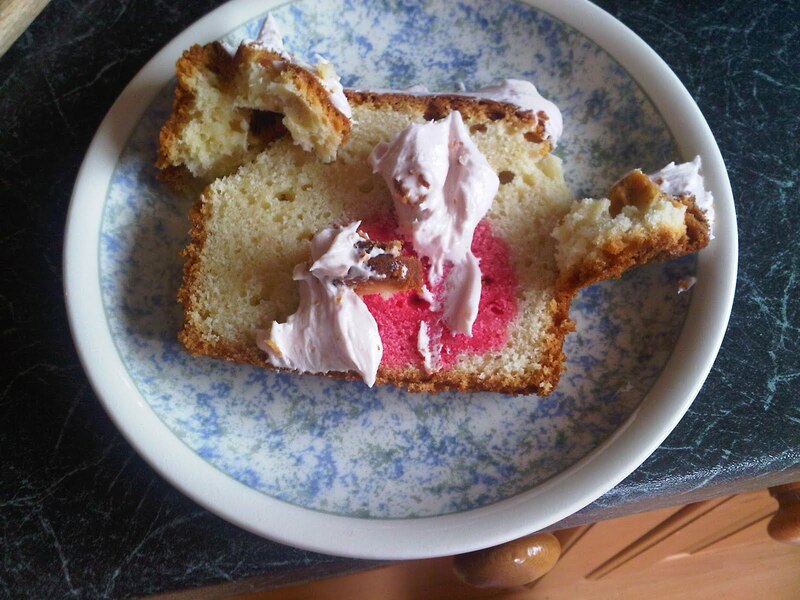 Due to no recipes, no heart shaped cutters and generally no idea whatsoever, this cake became completely about compromise which unfortunately became it's downfall. 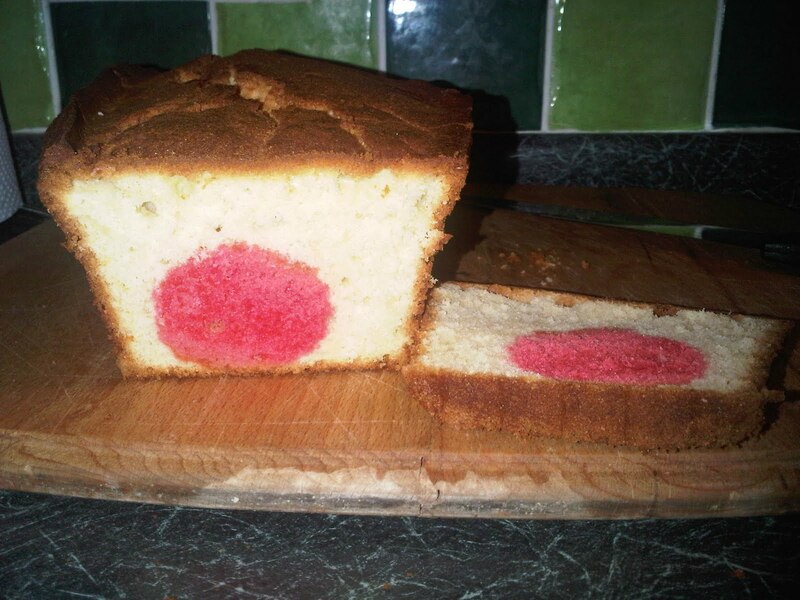 I followed a Vanilla Sponge recipe from The Caked Crusader and then adapted it to fit the instructions from Butter Hearts Sugar by splitting 1/3 of the batter and colouring it red. 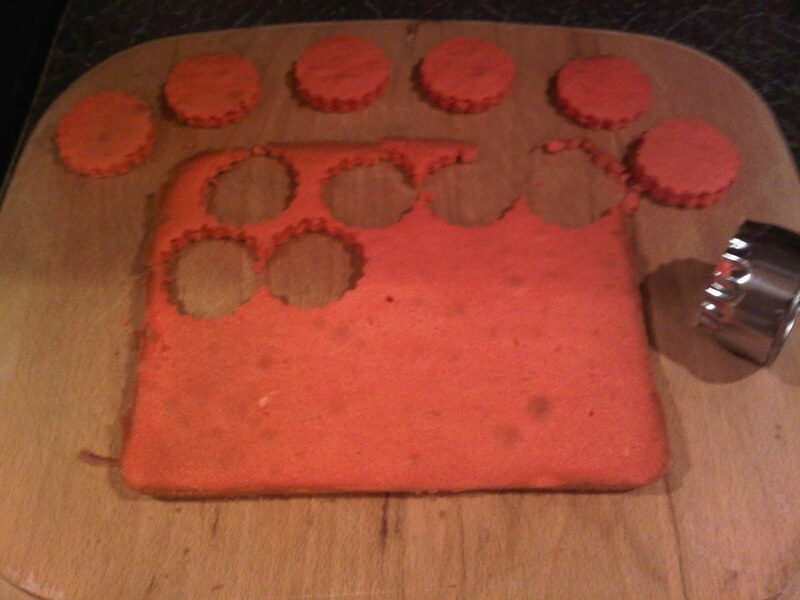 At this point I became confused, the sponge recipe was to be cooked for over an hour but once splitting the batter, I had to cook the red sponge for 20 minutes. 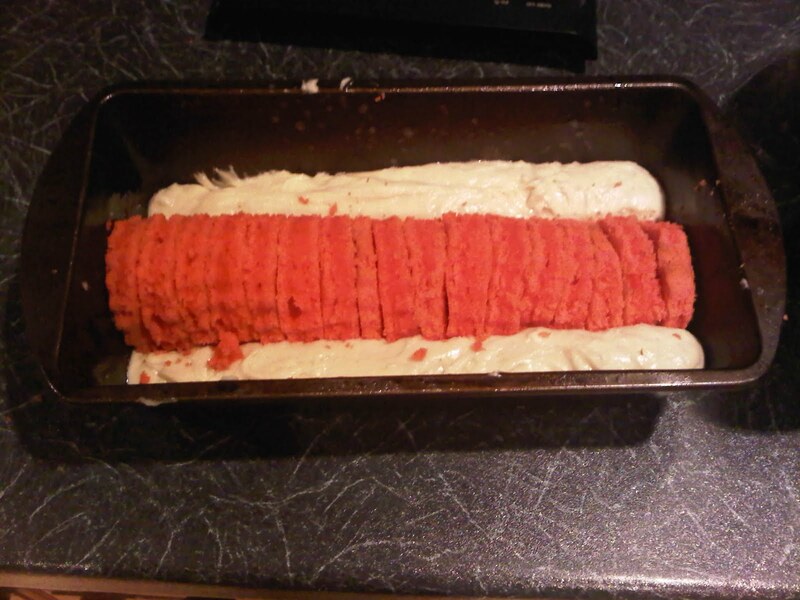 Aswell as this, one recipe said 180 degrees and one 160 which I set my oven to. After about 16 minutes, the cake was browning and a skewer came out clean. I then layered the remaining batter over the top and the secret was concealed! This went in the oven and, although the recipe said 1 hour 20 minutes, this was for a round sponge and my loaf tin was rather small. After about an hour, a skewer was coming out clean. 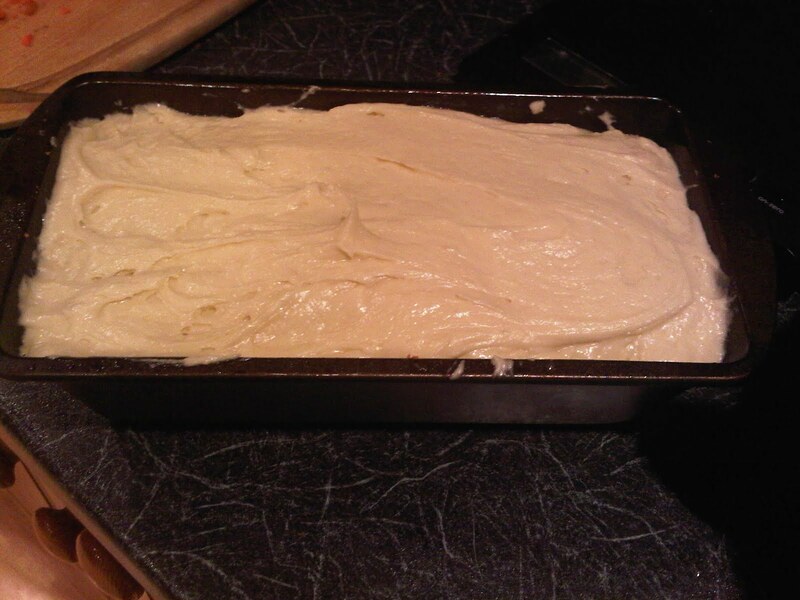 The sponge recipe from The CC came with a syrup and a buttercream but I chose not to use these as the amount of buttercream was too much to cover such a small cake and, as it was nearing midnight, I really couldn't be bothered to make the syrup (sorry!). Having gone to bed with an unfrosted cake (not literally), I decided it needed a bit of buttercream as when I cut into the cake, it was incredibly dry. This may well have been because I chose to ignore the use of the syrup but I genuinely believe it was the fact that some of the cake is baked twice. 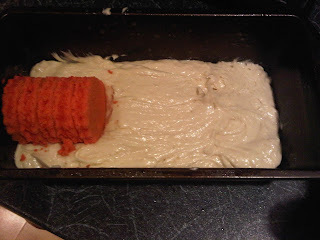 The white (and cooked once) sponge is tasty but the red sponge is dry and tastes peculiar, obviously not helped by being cooked twice, once undercooked. I whipped up a buttercream (also from The CC), but put in some strawberry jam to match the reddish theme. This provided a good colour but little flavour. 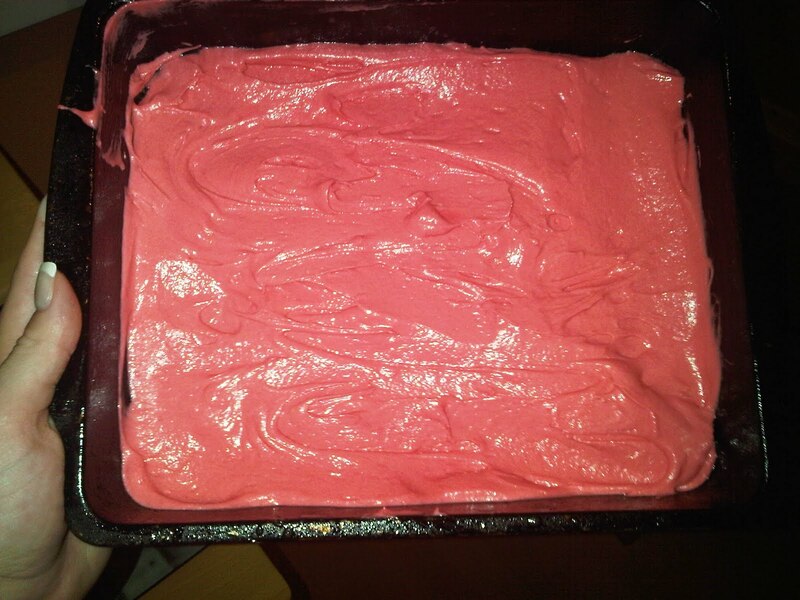 I figured the cake had been so much about compromise that a little more wouldn't hurt and I added 1/4 teaspoon of Strawberry flavouring. The cake is also too crumbly to cut! With thanks to Bake it in a Cake, The Caked Crusader and Butter Hearts Sugar for all of their recipes and my complete apologies for ruining what could have been an awesome cake!! I have provided a link to all of the full recipes above but have written the recipe below in the way that I used them. Post Blog Update: I allowed the cake and buttercream to do their thing in the fridge over night and the buttercream has matured somewhat into a more delicate flavour. 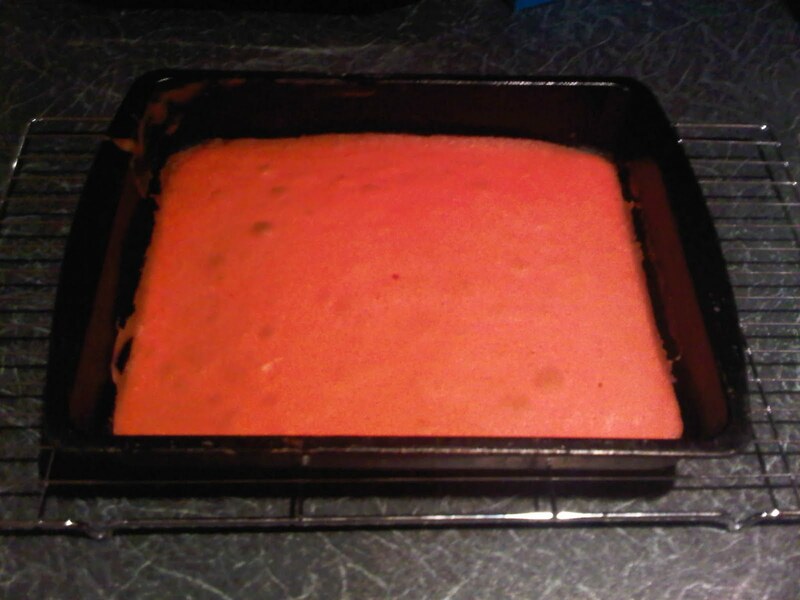 The cake has also moistened completely and has an all round better flavour. Upon reflection, I really like this cake!! 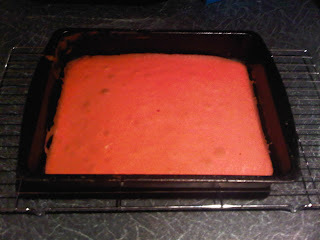 Put 1/3 of the mixture into a separate bowl and colour with red food colouring. I went all out here and used quite a few drops! I'm sorry the cake didn't turn out how you were hoping, it looks cool. I know what you mean about the cake seeming dry, the first time I tried this idea I used a coconut cake which stayed nice and moist but I've since tried using a butter cake and the colour cutout did dry out a bit. It looks really cool even if it was a bit dry. Hiya, Butter Hearts Sugar, I'm determined to make this work as yours seemed so nice! Maybe it works best when the baker knows what they're doing, as I clearly do not! Miss Cake Baker, thank you! After a few hours in the fridge it was good enough to eat! I love the idea of a cake in a cake - your first attempt looks pretty good and I'm sure, when you try it again, you'll perfect it! I really hope so! Im sorry for ruining your vanilla sponge! I'm a student by default but a baker by choice! I have a beautiful KitchenAid named Kevin and together we will conquer all that comes at us! I may not have the perfect cupcakes, but they sure are tasty! So here I am, taking the hits and writing about it along the way! Kinder Bueno Cupcakes- Take 2!